Need your handkerchiefs in a rush? Please email info@thehandkerchiefshop.com and I am happy to try to accommodate. We specialize in handkerchiefs for all occasions: wedding handkerchief, monogrammed handkerchief, personalized handkerchief and custom embroidered handkerchief. The Handkerchief Shop's handkerchiefs can be personalized with monograms and messages or customized with logos and designs. Welcome to The Handkerchief Shop! My name is Colleen. I'm the owner of The Handkerchief Shop and designer of Happy Hanky and The Hank. Let me tell you a little about who we are. I am proud to make all of my handkerchief collections locally. All of the handkerchiefs that you see here are exclusive to The Handkerchief Shop. I source all of my lace and fabric from local vendors. Custom embroidery is done both in-house and I also get to work with a wonderful local embroider that helps me embroider all of your special, personalized messages. I design two brands of handkerchiefs, Happy Hanky for ladies and The Hank for men. 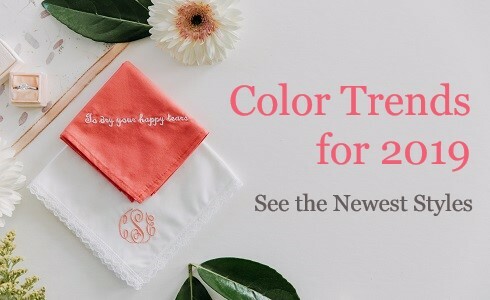 Both handkerchief collections can be personalized or monogrammed for weddings, holidays, anniversaries, going away parties, showers, birthdays or many other special occasions. Happy Hanky is a unique line of wedding handkerchiefs designed to dry happy tears. The super stylish handkerchiefs are handmade from 100% cotton and come in beautiful colors and floral prints, some with dainty trims. Each Happy Hanky comes packaged with a special happy tears poem. To make your handkerchief extra special, choose the personalized embroidery option for custom embroidery or monogramming. What a lovely keepsake for the bride, bridal party or someone celebrating a special occasion. The Hank is a stylish line of men's handkerchiefs. The fun prints and patterns make it the perfect practical gift for the fashion-forward gentleman. Handkerchiefs are a pocket staple for every guy. 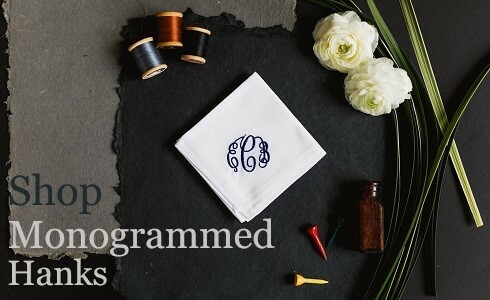 Create your own monogrammed handkerchief or personalized handkerchief with the click of a few buttons. I also offer Basic Bundles. Basic Bundles are bulk 12 piece stacks of handkerchiefs that are perfect to give as favors. The ladies basic handkerchiefs have lace edges and the men's basic handkerchiefs are the no frills, get the job done kind of handkerchiefs that your grandpop used to carry. Visit our "For the Wedding" section for lots of wedding ready embroidered messages that are sure to show your appreciation and love for all the special people in your life. Personalize the message on the handkerchiefs with your name and wedding date to have the perfect sentimental keepsake to give at your wedding to show your gratitude to the ones you love. Want to do something totally custom and unique? No problem! Select any one of our handkerchief styles found in the "For Her" or "For Him" sections. Next select "Embroider A Custom Message" and enter up to 130 characters. Lastly, select your font, thread color and positioning on the handkerchief. Still want something more unique? How about a writing a note and having The Handkerchief Shop digitize it with our Handwritten Embroidery(TM) option. We can also digitize logos, crests or drawings for embroidering on our handkerchiefs as well. With all of our handmade, unique handkerchief styles and the largest amount of embroidery thread colors to choose from, The Handkerchief Shop is truly the best place to shop for one of a kind handkerchiefs! Enjoy your visit to The Handkerchief Shop! Please let me know if there is anything I can do to help you. "The service and product are both phenomenal. The team at the hankerchief shop were great and worked with us to quickly turn around a wedding gift for our moms. The embroidery turned out nice as well! Glad we purchased through them and would recommend it to anyone!" -Kendall M.
"I purchased this as a gift for my daughter. It is so perfectly dainty and sweet. I know she is going to love it." -Stephanie D.